In case you get the wrong idea about what I'm trying to say in this post, check this out. If I hear it one more time, I'm going to puke. The Conversation. Nearly every long-term traveler anticipates it and many start to really despise it. It is the same bloody conversation that you have with anyone new you encounter on your journey. For some travelers like me and William, we meet all new people every five days or so. And every five days, we have the Conversation 20 times in a day. "Where are you from? Where have you been? Where are you going?" Ahhhhgh! NO! Don't ask me again!!! NOOOO!!! You can bet money on it and fund your way around the world. Your sitting there in your hostel bed and two backpackers come into the room. You make eye contact and give a fake smile and a subtle nod of the head. From here, it's over. I can already see the slow-motion play of one of the backpacker's mouth rounding to making the "wh" sound. Me: "-Am I from? The States." Guy: "Ah, Kentucky Fried Chicken!" Me: [shutters offering a fake smile] "Indeed." Guy: "So, have you been traveling for a while?" Me: "-Have I been?" [And as if they were one big long word...] "GuatemalaArgentinaChileNewZealandAustralia." Guy: "Cool. How long are you traveling for?" Guy: "Where are you going next?" Me: [Sighs silently. Thinks, "Seriously!? Grrrr..."] "More places in South East Asia, some places in Europe, then Iceland and then New York." Me: "Yep. Pretty excited about it..."
If the conversation continues, I usually succumb to the pressure and ask the same blasted "Where you from/been/going" questions. Now don't get me wrong, I still love meeting new people and 3 WQ's are pretty important to making new friends, but if you KNOW you're never going to see this person again in just a few hours, just drop the whole thing. If you feel awkward, default to some different questions like, "What makes you happy?" or "What is your purpose in life?" If someone were to start off with those questions, I'd love them instantly. Funny story about the picture for this blog. I finished writing this blog (while sitting in a hostel kitchen) and looked around for someone to pose in the photo with me. I saw a guy who was writing in a journal or something. Perfect. I went up to him and said, "I was wondering if you could help me with something. I just wrote a blog about... [and explained the blog] ...and I was wondering if you could pose in a photo with me as you start to talk". He said sure and we took the pic. Immediately afterwards he said, "So where..." He stopped and chuckled, "I guess I'm going to ask that question - where you from?" He's from Canada. He's been staying in Australia. He going to go visit some friends in New Zealand and then come back to Australia again to work. Haha! I love you Scott. I think you miss the point of traveling and what it means to be a traveller. Do you ever show some interest in fellow travellers and initiate "the conversation"? The KFC thing was a big deal in South Africa as well. The women on the trip were MUCH better at making the locals feel like they had said something profound than I was. They would laugh and it would be a grand joke. I just sat there and farted. "Now don't get me wrong, I still love meeting new people and 3 WQ's are pretty important to making new friends [...] default to some different questions like, "What makes you happy?" or "What is your purpose in life?" If someone were to start off with those questions, I'd love them instantly." This is more of a call to be more creative when meeting new people on the road so that us travelers don't feel like robots with every new people we meet. It's a fantastic thing when you can have interesting conversation with someone you know nothing about and then discover where they're from later on in the conversation. Duuude, i'm right there with ya. I mean i havent traveled, but if i had or do in the future, i will begin to dread them too!! Haha, but i dont really know how i would go about changing "the conversation", ha, but i really get where your coming from, even the joking part. No misunderstandings here! 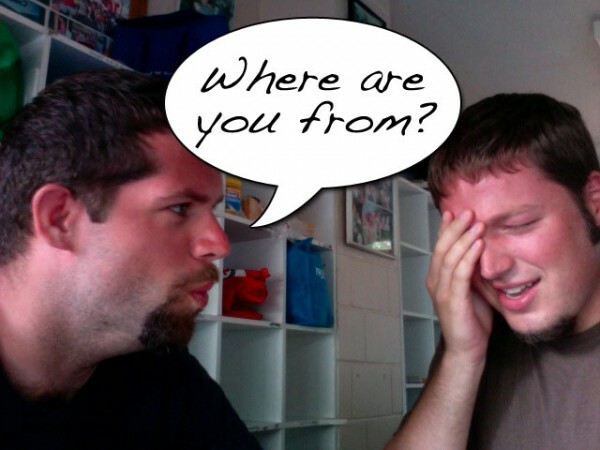 Asking a person where are they from does break the ice to arrive into a deep conversation. I try not to talk about my story because it is getting longer and longer and many traveler can get jealous, although for some people it is good for them to hear my story. Although don't talk about myself unless I am asked. Just say the state your from, it's better than the lame answer "states". You need to deepen the conversation, I end up in deep conversation with 95% of people because I am a deep person of reality. Read my blog, it reveals deep context. Get ready to get pounded with repeated questions when you come back, as well. Just not the 'where are you from' kind.